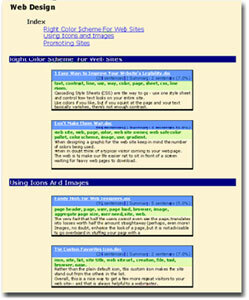 Within the years of my work with web design, a considerable amount of documents has been collected on my computer. It was high time to sort them out and get rid of irrelevant and out-of-date information. It was not that easy work because some of the documents were big in size while some others were similar in content. Intellexer Summarizer was a great assistant to me. Summarizer analyzes a text and extracts its key concepts so that the user can understand and appreciate the true sense of the text. This program works with texts in English only. Exactly this feature was advantageous for me since all my documents are just in this language. Intelllexer summarizer is easy to use. You can either open a document for summarizing in a traditional way or drag it into the window of the program or open Summarizer in Windows Explorer, right-click the document and click the corresponding item in the shortcut menu. Alternatively, you can paste a copied text into Summarizer from the clipboard. Summarizer starts working automatically. Before the summarization, I recommend to set up custom summarization options, such as: the summary size, document theme, and adjust summary by changing concepts weight of the document you are summarizing. I'm pleased to announce that the developers managed to find out the solution of how to store and use all the summaries you obtain. Summarizer has a history where you can keep summaries grouped by date and search by concepts. Moreover, each summary is presented in a form of a table where you can find a link to a document, key words (concepts) and the summary itself. This table with saved formatting is copied into MS Word so that the catalogue of important links and articles with detailed comments is created. For the sake of convenience, I've divided summaries into groups and gave them titles. Doing this didn't take me much time. 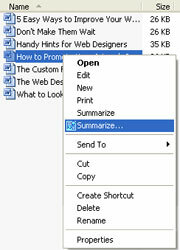 One more feature of Summarizer is that it can totalize letters in MS Outlook. Due to this program we can read only a short summary instead of reading long letters. Thanks to Summarizer, it's also possible to surf the web - to read a summary of any page of a site without opening it. Just write a needed URL and click "summarize". 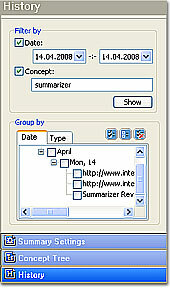 I wish to hope, I gave you a clear view of making summaries with the help of Intellexer Summarizer.